Pilobolus is heading back down under! Reviving this collaborative creation between Pilobolus and World Science Festival 2017, Time and the Creative Cosmos celebrates the human spirit of exploration and discovery. This thrilling fusion of science and art highlights our collective longing to transcend the boundaries of space and time. Through original choreography, eclectic musical and stage performances, acclaimed physicist Brian Greene unveils the mysteries of life and the universe. Performance is March 23rd at 8:00 PM. Featuring Brian Greene, Pilobolus, famed violinist Joshua Bell, renowned opera star Renée Fleming, singer David Draiman from the iconic hard rock band Disturbed, Broadway leading man Brian Stokes Mitchell, and string trio Time for Three, among others. To see more international performance events, visit our Tour page. Looking back on an incredible year! You can help us continue to turn crowds into communities. Support our efforts to brighten people’s lives with art and wonder by making a tax-deductible donation today. Photo by Megan Moss Freeman. Five Senses Festival Holiday Pop-Up! Winter is fast approaching, but we’re already finding ways to reconnect with our favorite part of summer – the Five Senses Festival! We’re hosting a Five Senses Festival Holiday Pop-Up – indoors, at the beautiful Washington Club Hall – Sunday December 16. It’s free, and open to the whole family! FREE and Family Friendly. No tickets required. Visit fivesensesfestival.com for full schedule, or to learn more about the full Five Senses Festival! In the Studio with WIRED Magazine! We recently connected with WIRED to film an episode for their new streamable video series, WIRED Masterminds. "GOOD IDEAS ARE LIKE A MOUSE IN YOUR HOUSE." 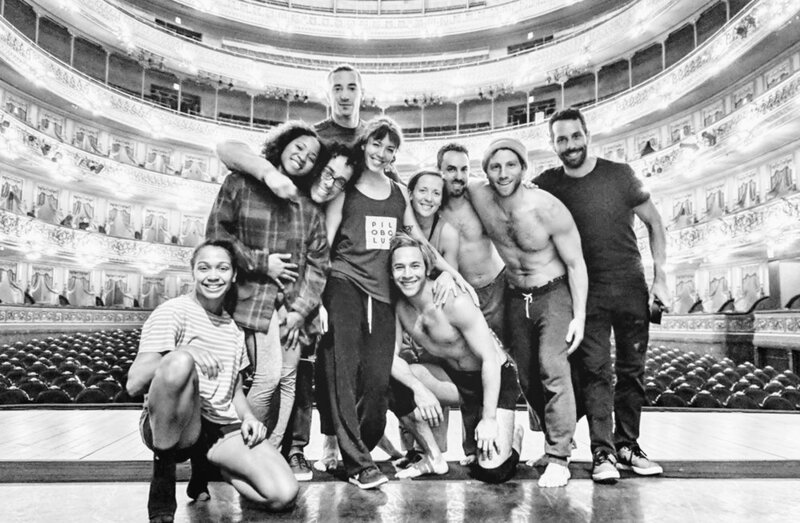 WIRED joined us for a full day of rehearsals, taking a close look at the Pilobolus creative process, how we build shapes and shadows out of human bodies, and how collaboration shapes our outlook. We chatted about the surprising physicality of shadow theatre, and shared a rare behind-the-scenes look at how our shadows are created. Check out the full story on WIRED.com or the WIRED Masterminds series on YouTube. And if you love the show, you can watch the next episode now exclusively by downloading the WIRED OTT app on Roku, Apple TV, Android TV, and Amazon Fire TV. To see Pilobolus onstage, check out our Tour Calendar. Or join us at a Workshop to explore the Pilobolus creative process yourself! Photo courtesy of WIRED Masterminds. 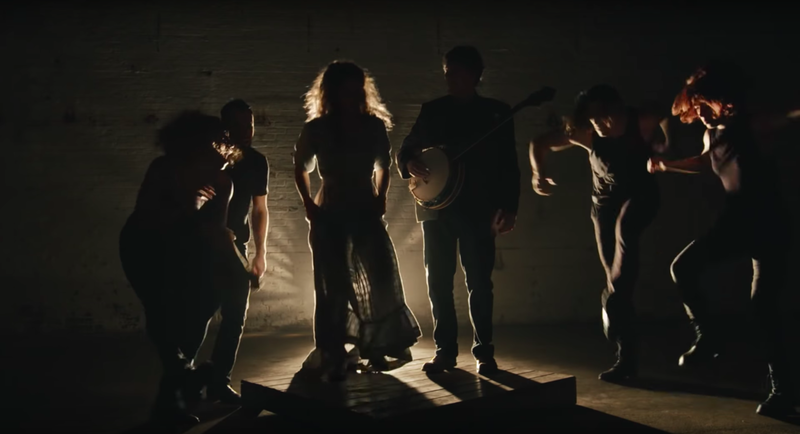 A Music Video with Béla Fleck and Abigail Washburn! It's been hard to keep quiet about our incredible collaboration with Béla Fleck and Abigail Washburn – but we're finally ready to share! Last summer, we collaborated with the music duo on Echo in the Valley, a live Pilobolus performance, performed to music by Béla and Abby. This summer, we've released a new collaboration - a full music video featuring Béla, Abby, and Pilobolus! Check out the full story, and watch the complete music video on Rolling Stone and The New York Times! We hope you’re ready for an incredible summer. We’re thrilled to be partnering with three of the most storied dance festivals in North America within the span of a single month – before we launch our own festival right here in Litchfield County, CT! We’re kicking off the season at American Dance Festival in North Carolina, with two Pilobolus World Premieres. Next, we head to Jacob’s Pillow in Massachusetts, and on to Victory Dance, Lake Placid, and Chautauqua Institution in New York state, before heading west for performances in New Mexico and Colorado, at the Aspen Santa Fe Ballet. And finally, our summer culminates with the premiere of our new fall tour, Come to Your Senses, at Pilobolus’s inaugural Five Senses Festival – a multi-arts extravaganzaon a farm in our rural home. Keep your eyes and your ears open for an announcement you won’t want to miss! To see our full performance schedule, visit our Tour page. To learn more about workshops, intensives, and community events, visit our Workshops page. We’re flying coast to coast this April to collaborate with some of our favorite dance organizations. First, we'll be joining Dancers Responding to AIDS in the Hudson Valley for a mimosa brunch, where we'll help kick off their fundraising season with a performance of Symbiosis, followed by a post-performance chat with our dancers! Then we're heading to the west coast as a part of Dance Camera West's "To the Sea: Dance Concerts on the Pier" co-curated with Jacob Jonas Dance Company. Meet us at the Santa Monica Pier, where we're sharing a special performance of On the Nature of Things. The event is free, but RSVPs are required. To hear more about how you can bring Pilobolus to your organization, visit our Tour page or check out our Workshops. This spring, we’re bringing our Pilobolus workshop programs to NYC. Gibney’s drop-in partnering classes on Wednesday mornings from March 21 to April 11 will be a PiloboPopUp devoted to creative partnering techniques, expanding awareness and opening the senses. Bold dancers looking for a more immersive Pilobolus experience are encouraged to join us April 14-15 for a two-day intensive exploring the rules of group improvisation, and providing participants with the building blocks for impactful collaborative choreography. Learn more. 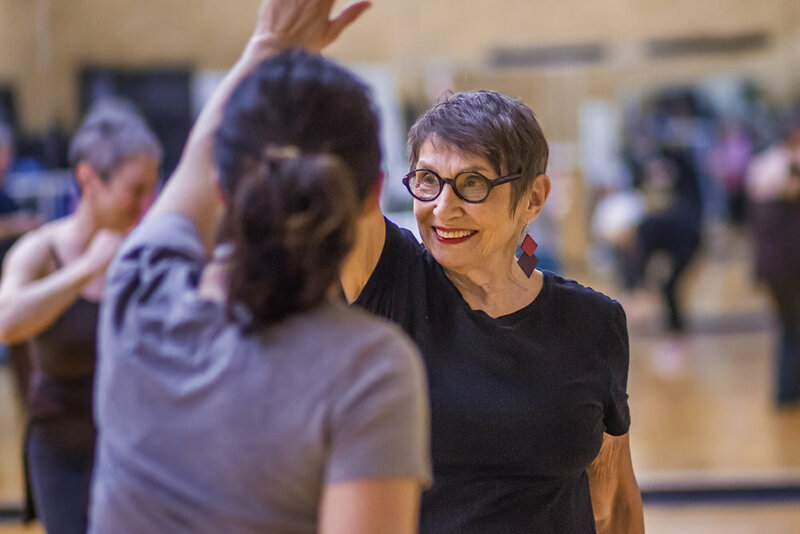 For the older among our NYC Pilobolus fans, we’re extending the pilot program for our wildly successful Connecting with Balance classes at the West Side Y in NYC. CwB teaches older adults to become mindful of balance, and we provide exercises that provide fun ways to enhance balance and coordination by engaging in a communal creative process. Learn more. 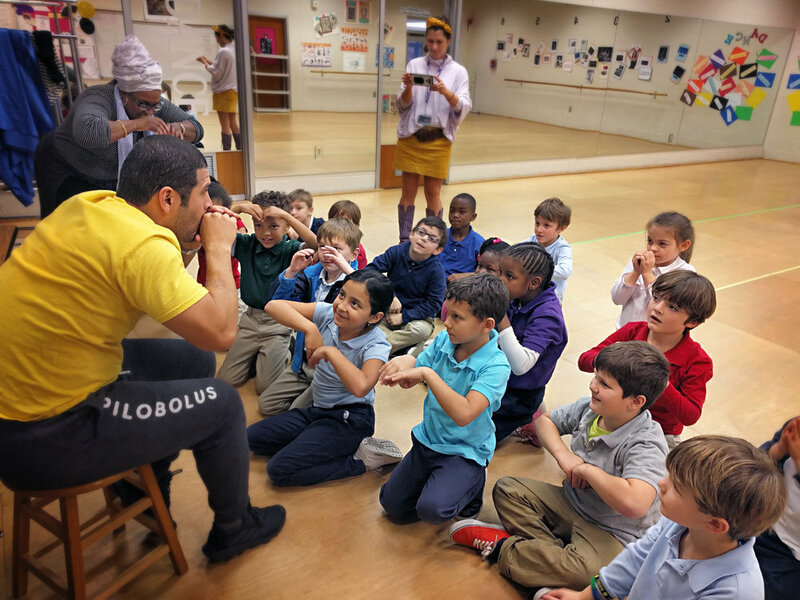 Our Pilobolus @ Play workshops tour too! 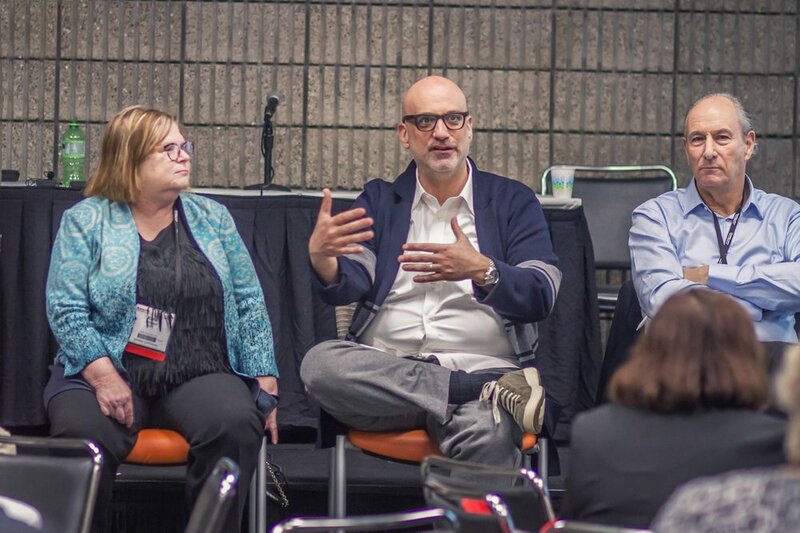 We are connecting with communities of all ages, through our upcoming workshops in Florida, Pennsylvania, Connecticut and more! 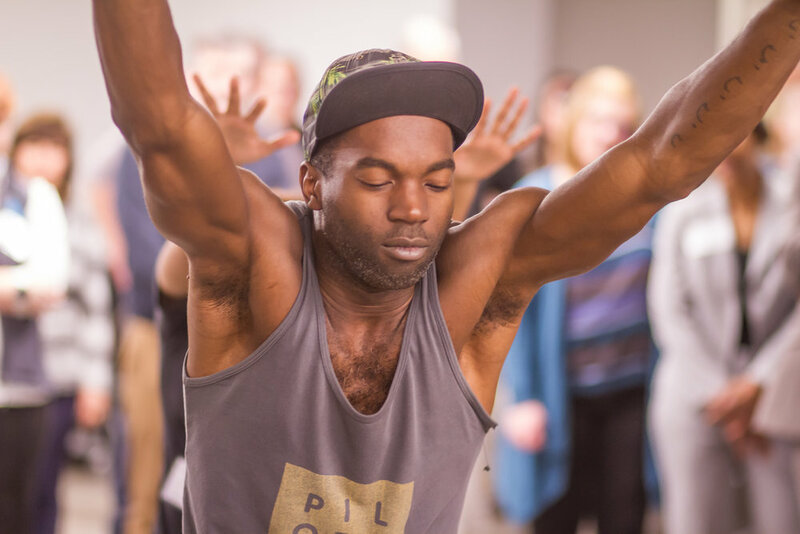 Check out our Workshops Page to learn more about upcoming workshops and intensives – or how you can bring Pilobolus into your community. We just wrapped our winter tour with performances and workshops in California, Florida, Vermont, New York, South Carolina, and Kentucky, only to return home to a winter storm. 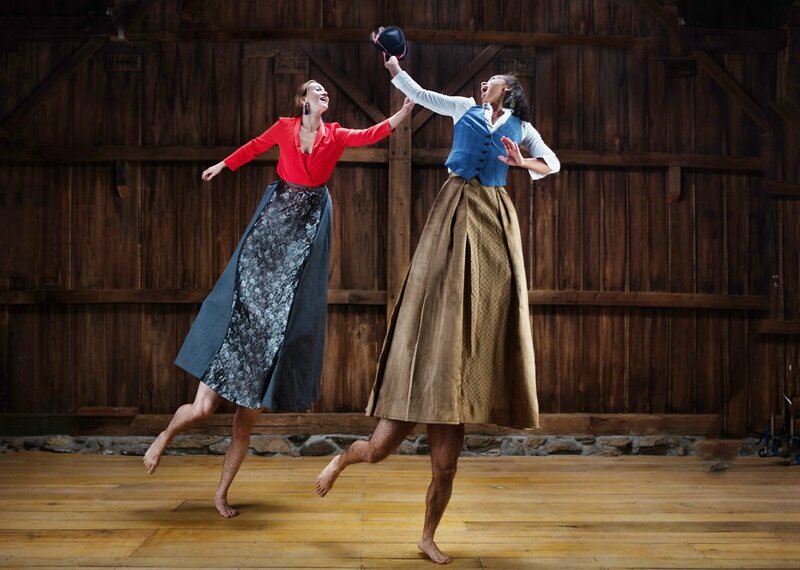 But warmer weather is just around the corner, and when it comes we zoom off to storied festivals around the country: catch a new premiere at the American Dance Festival in Durham this June...and then come see us during our week at Jacob’s Pillow or Chautauqua in July. And be sure to keep an ear out – there's so much more to come! Check out our Tour Page for a full list of upcoming engagements – or follow us on Facebook for the latest tour and events news. This weekend we opened our doors to share a Pilobolus experience with friends and neighbors in the Washington Depot area. 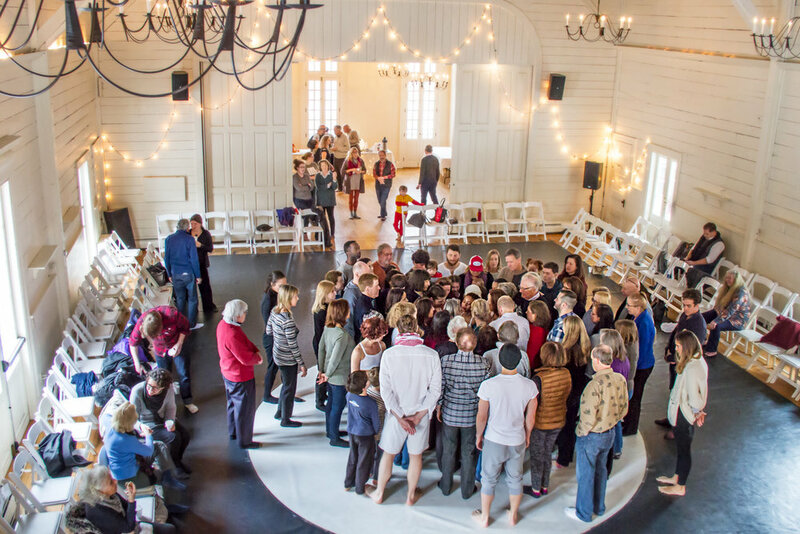 We connected with our community in a movement exercise, followed with a studio performance of Symbiosis and Rushes. To all those who joined us, thank you for sharing your Sunday afternoon with us – and for all your support (especially the physical kind)! We loved having you in our studio home. Stick around....we may have some exciting news to share with you soon. To be the first to hear about similar events, be sure to sign up for our mailing list! We’ve just wrapped up an incredible tour of Europe and Asia, that led us from the Akropolis in Greece to the Great Wall of China. 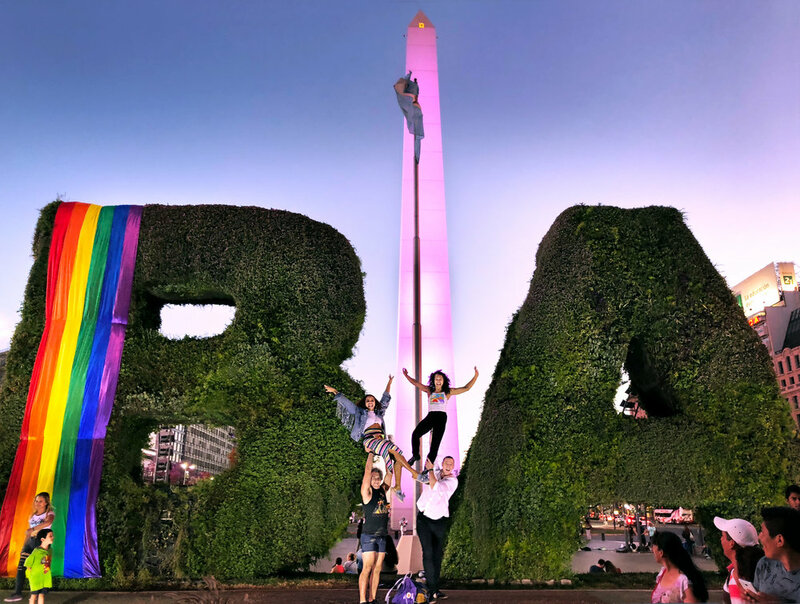 It’s been incredible to connect with a community that spans the globe, see old friends, and make new ones. Pilobolus was recently invited to perform at the largest women’s university in the world: Princess Noura bint Abdulrahman University in Riyadh, Saudi Arabia. 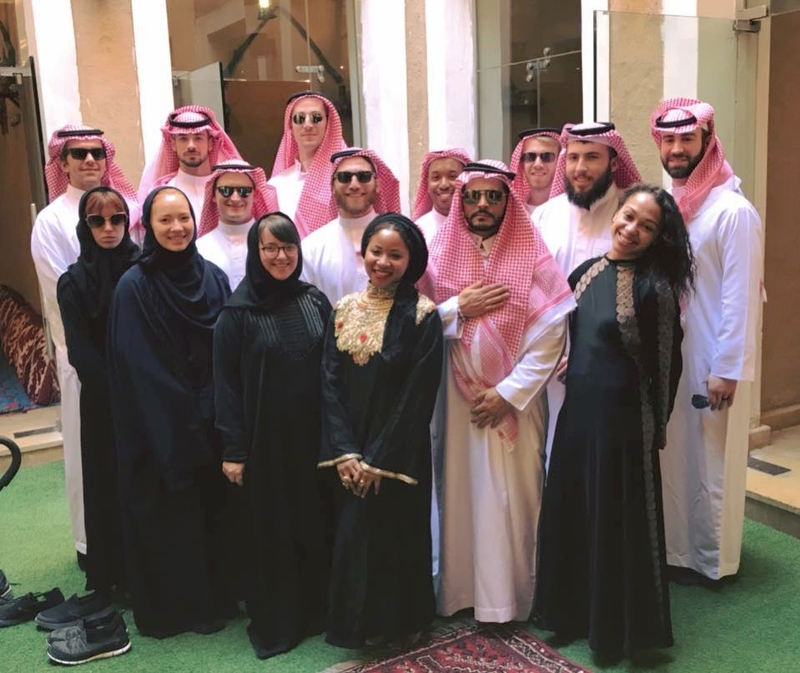 We were honored to share this singular experience of cross-cultural exchange – as the first western dance company to perform in Saudi Arabia. Pilobolus loves to discover what is possible when people join together. Diversity and trust inspire our work, and we take advantage of every opportunity to perform for new audiences. 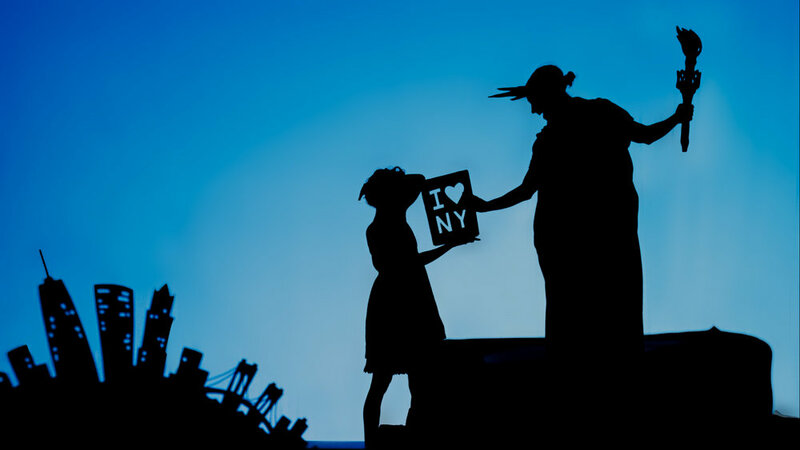 In a moment when values about women’s roles and independence are shifting globally, our mixed-gender performance of Shadowland, a work exploring a young girl’s imagination, took on special meaning. 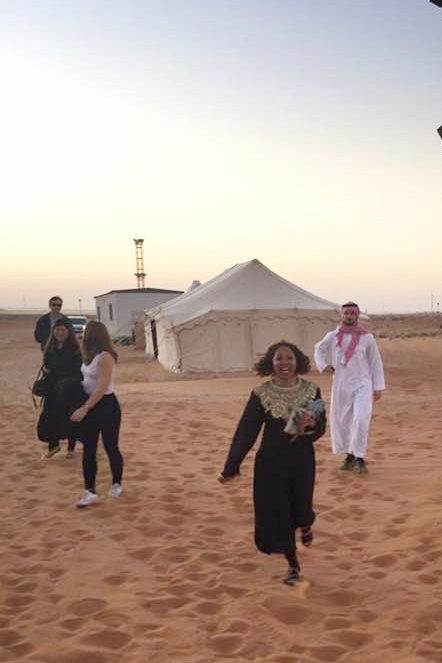 Our Saudi hosts graciously shared their beautiful country and culture with us, inviting us to see landmark buildings, and even race across the desert on horseback. We hope these personal connections and historic performances herald a new era of cultural partnership and arts access. To find out where we’re headed next, check out our Tour page, or follow us on Facebook. This winter, we’ve found new ways to connect with our audiences and fans – and not just metaphorically. 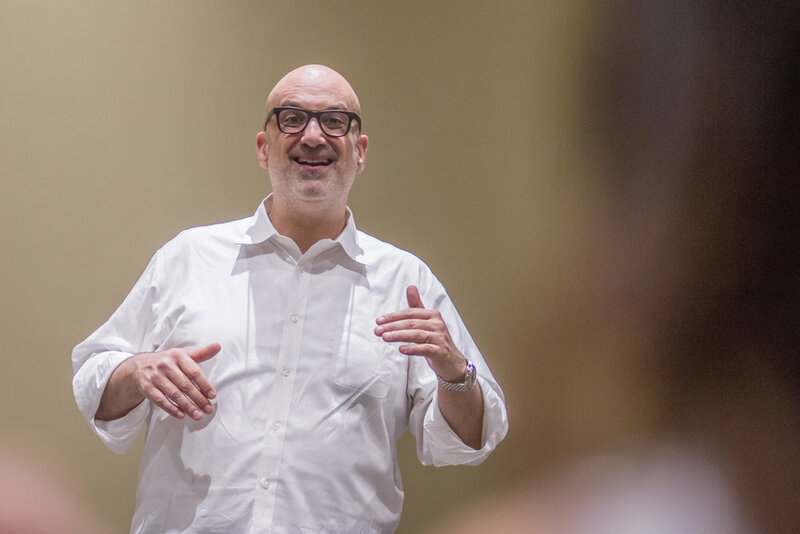 We’re sharing the Pilobolus experience with attendees from New York to Boston to Hilton Head to Vegas – through fun creative classes and workshops exploring movement, balance, connection, and community. It’s been so inspiring to work with so many curious, engaged movers and dancers, and we hope our participants are feeling more connected with our work and process. We’re feeling closer to you than ever, and we can’t wait to continue to engage and share as we build opportunities for collaboration and connection. To learn more about similar programs, check out our Workshops page. Not all of our work happens on stage. 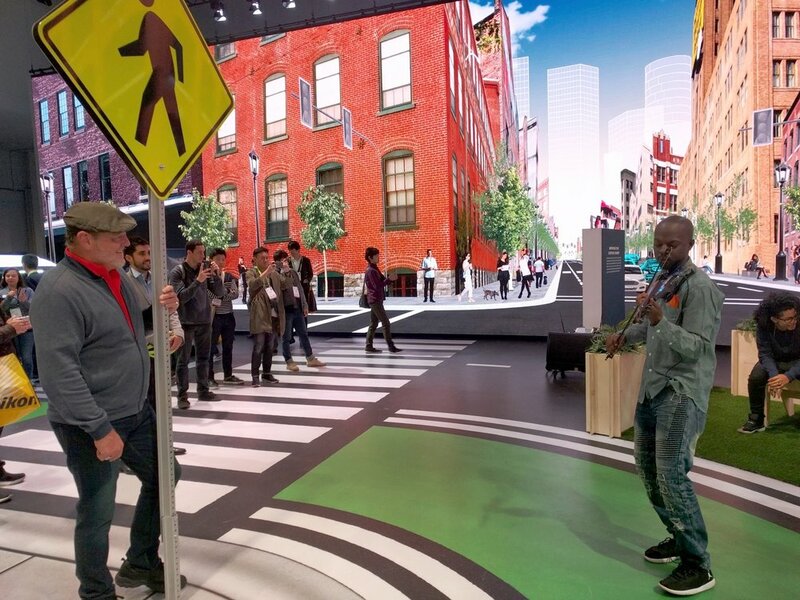 We recently partnered with Alex McDowell (designer of Minority Report) and his company, Experimental, along with Ford's creative agency, Civic, to create a live experience for Ford at CES. 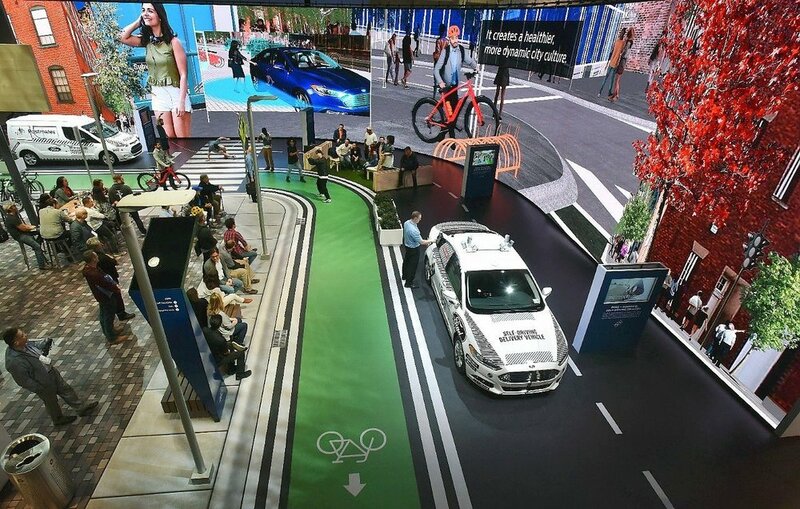 Together we created a street corner of the future, wired with cutting-edge mobility technology. Pilobolus was responsible for scripting and directing 20 actor/citizens that brought the street to life. 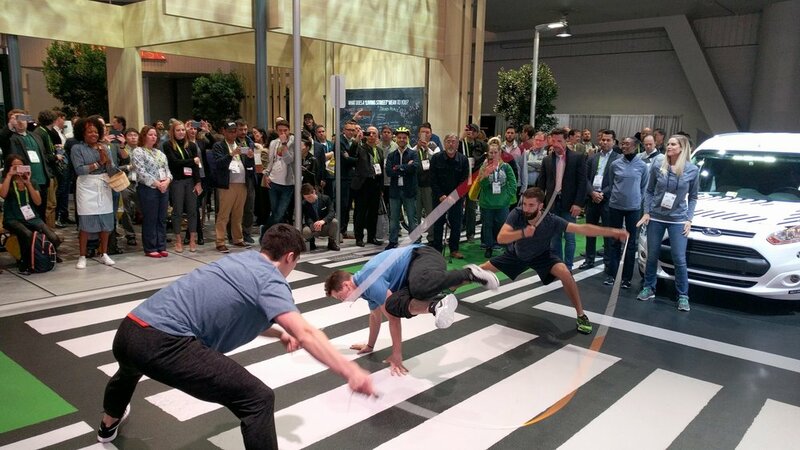 The booth made quite a splash, making it into many best of lists for CES this year. We love being at the forefront of new ideas, and were excited to join the conversation on movement, technology, and how we can improve lives and strengthen human connections. Pilobolus performed an excerpt of On the Nature of Things at Christie's Auction house in New York, at a private event for Facebook. 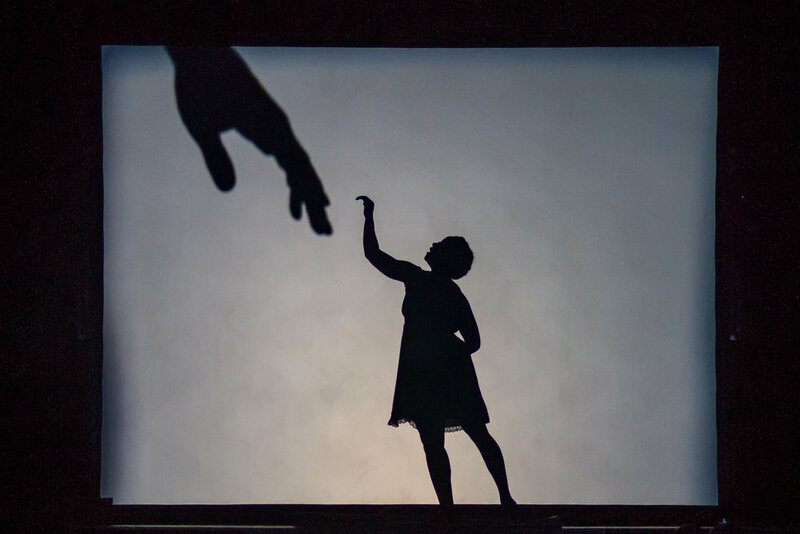 Pilobolus opened AT&T's inaugural business and technology summit in Dallas, TX this summer with a commissioned shadow piece about business transformation in the digital age. Read LinkedIn's write up of the event here.